Online course providers may charge up to $20 to take an approved course. BoatUS course: The BoatUS Foundation's Texas Boating NASBLA-approved course consists of 6 lessons and a Final Exam. The BoatUS course is free. *TPWD Online courses go through a rigorous certification process. All approved courses must first be certified by the National Association of State Boating Law Administrators (NASBLA). NASBLA is a national organization made up of all State Boating Law Administrators. 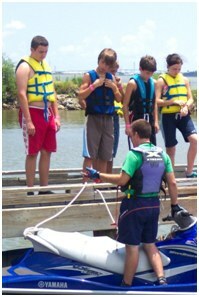 This body of professionals sets standards that all State Boater Education programs must adhere too. After an internet course provider meets the NASBLA Standards they must submit an application to TPWD and pass a review process.